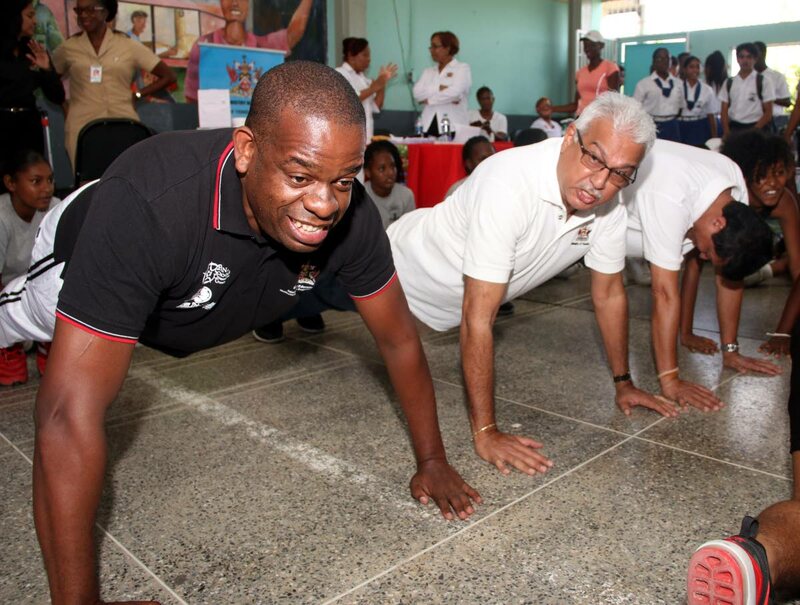 Minister in the Ministry of Education Dr Lovell Francis, left, along with Minister of Health Terrence Deyalsingh, centre, and MP for fyzabad Dr Lackram Bodeo do push ups at the Fyzabad Anglican Secondary School yesterday. Health Minister Terrance Deyalsingh has vowed to reduce the number of limb amputations due to diabetes by some 20 per cent by 2018 as TT currently performs some 500 limb amputations annually. Speaking to reporters following the launch of the health schools initiative at the Fyzabad Anglican Secondary School yesterday, Deyalsingh observed that research done over then past ten to 15 years showed the nation’s school children were suffering from high rates of diabetes, hypertension and obesity. “Today we are continuing the drive to get our children to understand the need for physical activity, the need to watch what they eat, what they drink, what they take into their bodies so that the next generation doesn’t succumb to diabetes and obesity,’ he said. Deyalsingh said the current bed to population ratio was about 2.7 beds per 1000 patients and was expected to increase to about three beds to 1,000 patients with the coming of the new hospitals such as the one in Point Fortin. However, he said that could be negated if people did not change their lifestyles or start to take preventative measures against non-communicable diseases (NCD) such as diabetes, hypertension, stroke and heart attack. He also noted that the Point Fortin hospital was about 40 per cent completed and was scheduled for completion by May 2019. Deyalsingh, Francis and Fyzabad MP, Dr Lackram Bodoe all participated in an aerobic burnout with students as part of the fitness programme. Reply to "Deyalsingh: 500 limbs lost to diabetes each year"